Theodore Roosevelt was a two-fisted rancher in the Dakota Badlands, a corruption-hunting police commissioner in New York City, a guns-blazing Rough Rider in Cuba, a corporation-taxing governor in Albany, a trust-busting president in Washington, a big-game hunter in East Africa and a fearless explorer in the malariainfested Amazon jungle in Brazil. But home was Sagamore Hill. For the large Roosevelt family, the rambling, 23-room mansion on 95 acres on Cove Neck in Oyster Bay, overlooking Long Island Sound, was a sanctuary. "After all, fond as I am of the White House and much though I have appreciated these years in it, there isn't any place in the world like home - like Sagamore Hill," Roosevelt wrote in June, 1906, to his 14-year-old daughter Ethel. And for seven summers all roads led to Oyster Bay. From 1902 to 1908, President Theodore Roosevelt's Sagamore Hill was the summer White House, the focal point of world affairs, where the 26th president combined the nation's business with his family's recreation. Momentous events happened there: In the summer of 1905, Roosevelt mediated a settlement of the war between Japan and Russia, for which he received the Nobel Peace Prize, the first Nobel ever awarded to an American. Folksy events as well: At the end of his first summer as president, Roosevelt held an open reception where 8,000 people showed up on the great lawn to drink lemonade, eat gingersnaps and shake hands with the president. It was like a county fair. After the receiving line had gone on for two hours, a woman commented, "Mr. President, how tired you must be!" "Not a bit!" Roosevelt responded in his high-pitched voice, his prominent teeth snapping. "It takes more than a trolley car to knock me out, and more than a crowd to tire me." He continued shaking hands for two more hours. Although he was born sickly and had to build himself up physically, Roosevelt was to prove such durability many times over, including surviving an assassin's bullet in the chest in 1912. At Sagamore Hill, Roosevelt was able to pursue the strenuous life that he advocated. And the children and their relatives and friends were his partners, as was sometimes his wife, Edith. There were romps in the woods, horseback riding, hiking, tennis, pitching hay, chopping wood, rowing in Cold Spring and Oyster Bay Harbors and overnight camping trips with a half-dozen boys. "The boys are sufficiently deluded to believe that the chicken or beefsteak I fry in bacon fat on these expeditions has a flavor impossible elsewhere to be obtained," he wrote to a friend. Roosevelt's hyperactive relaxation was legendary. The Chicago Tribune once ran a six-panel cartoon titled "The President is resting at his home in Oyster Bay." These were the six captions: "He first chops down a few trees . . . After which he takes a brisk stroll of twenty miles . . . And rests a moment or two . . . Then has a little canter cross country . . . He then gives the children a wheelbarrow ride . . . By which time he is ready for breakfast." When Roosevelt was playing with his children, he was like a child himself, and Sagamore Hill was usually overrun with Roosevelt kin, many of whom lived nearby. They treated him like one of the gang. "I am rather disconcerted by the fact that they persist in regarding me as a playmate," Roosevelt wrote to his sister-in-law Emily Carow on Aug. 6, 1903. "This afternoon, for instance, was rainy, and all of them . . . came to get me to play with them in the old barn. They plead so hard that I finally gave in, but upon my word, I hardly knew whether it was quite right for the President to be engaged in such wild romping as the next two hours saw." "I love all these children and have great fun with them," he added in a later letter, "and I am touched by the way in which they feel that I am their special friend, champion, and companion." Affairs of state often had to give way to affairs of the family. One July afternoon the president was in the library, meeting with a visiting dignitary to discuss Cuba. At the door of the library appeared a group of boys dressed in old clothes and sneakers. "Cousin Theodore," one of them said, "it's after four." "By Jove, so it is," Roosevelt said. "Why didn't you call me sooner? One of you boys get my rifle." Turning to his visitor, he said, "I must ask you to excuse me. We'll finish this talk some other time. I promised the boys I'd go shooting with them at four o'clock, and I never keep boys waiting. It's a hard trial for a boy to wait." Roosevelt's love of children was only one side of a many-sided man. He was a complex, multidimensional figure who, in retrospect, reveals himself in different ways, depending upon on which surface the light is focused. "There was so much of him," biographer Edward Wagenknecht once wrote. "The historical Theodore Roosevelt fits into no foursquare format," Roosevelt biographer Edmund Morris said at Hofstra University's 1990 conference on the former president. "No matter how large the confines of the study, he always requires extra space, added dimensions." Critics have a wonderful time with Theodore Roosevelt because he presents such a huge target. The popular image of him is reflected in a handful of scenes. One is with the Rough Riders in Cuba in 1898, leading a charge that helped win the battle for Santiago in the Spanish-American War. Another is the big-game hunter in the American West, or later in East Africa, whose thirst for blood sport seemed to know no bounds. And third, as president, the peacemaker, the conservationist, the trust-buster, the man who said it was wise to talk softly and carry a big stick. The public came to know him as Teddy. He never liked the nickname, but the newspapers used it anyway. Unlike that other great 19th-Century Long Islander from nearby Huntington, Walt Whitman, Roosevelt was not born on Paumanok. But once he found it, he never let it go. One of four children, the son of a well-to-do merchant - also named Theodore - Roosevelt was our only president born in New York City. That was on Oct. 27, 1858, in a brownstone at 28 E. 20th St. The family traced its lineage back to Klaes Martensen van Rosenvelt, an immigrant from Holland who settled in New Amsterdam about 1644. "I was a sickly, delicate boy, suffered much from asthma, and frequently had to be taken away on trips to find a place where I could breathe," Roosevelt wrote in his autobiography. Just before his 12th birthday, his father took him aside and said, "Theodore, you have the mind but you have not the body, and without the help of the body the mind cannot go as far as it should. You must make your body. It is hard drudgery to make one's body, but I know you will do it." "I'll make my body," young Theodore answered. "So began a course of exercise that continued for the rest of Roosevelt's life," writes H.W. Brands in his new biography, "T.R. : The Last Romantic." "He lifted weights, practiced gymnastics on equipment set up in a specially remodeled room in the house on 20th Street, took lessons in wrestling, rode horseback, hiked, climbed, swam, rowed and generally engaged in just about every form of physical activity imaginable, in hot weather and cold, rain and shine, days and sometimes far into the night." Roosevelt's first love was natural history, and early on he plunged into the study of plants and animals with the vigor with which he attacked virtually everything he attempted. He became a voracious reader and constructed in his bedroom his Roosevelt Museum of Natural History, which, because of the sounds and odors, was later banished to a back hall upstairs. His zoological studies were helped by summer excursions to the country, first in New Jersey, then later to Oyster Bay, which his grandfather and then his father found to be a splendid vacation spot. In 1874, Theodore Sr. rented a summer house in Oyster Bay, and the 16-year-old began a love affair with Long Island that continued until the day he died. In his autobiography, he proudly notes that it was recorded in an obscure journal that he had captured a fish crow and an Ipswich sparrow on the shore at Oyster Bay. And up on Cove Neck, there was a special hill he wandered, noting the birds and other animals, looking out over the Sound, and daydreaming. While at Harvard College, Roosevelt studied the natural sciences but his choice of a career began to drift toward public service. He was abetted in this by the first love of his life, 17-year-old Alice Hathaway Lee, the cousin of a classmate who was part of Boston's social set. The romance took its course while Roosevelt finished college, and in 1880 they were married. Roosevelt began law school at Columbia University, but he dropped out to run, successfully, as a Republican for the New York State Assembly, when he was 23. A few weeks after his wedding, Roosevelt thought about his favorite hill in Oyster Bay, and he conceived the idea of buying the property and building a mansion for Alice and their family, which he expected would be large. He purchased 155 acres on Cove Neck early in 1883 for $30,000, keeping 95 acres for himself and selling the remainder to relatives. By the summer, Alice was pregnant, and Roosevelt found himself on top of his hill, pacing the ground with architects and planning the solid, three-story, many-bedroomed house that would anchor him on Long Island for the rest of his life. He would name it Leeholm, in honor of the wife he adored. "I wished a big piazza, very broad at the n.w. corner where we could sit in rocking chairs and look at the sunset," he later wrote. "A library with a shallow bay window opening south, the parlor or drawing-room occupying all the western end of the lower floor; as broad a hall as our space would permit; big fireplaces for logs; on the top floor the gun room occupying the western end so that north and west it look ed over the Sound and Bay." Before the building contract could be signed, a double tragedy struck. In the ninth month of her pregnancy, Alice was living in a house on West 57th Street with her mother-in-law, Mittie Roosevelt, who was sick in bed with what turned out to be typhoid fever. Alice herself was not feeling well, and it later turned out that she was suffering from Bright's disease, an inflammation of the kidneys, a sickness that had not been detected earlier. On Feb. 12, 1884, Alice Lee Roosevelt was born in New York City while Roosevelt was in the Assembly in Albany. Not long after celebrating his firstborn with his fellow legislators, he received a second telegram saying that his wife was seriously ill. He arrived at the house Just before midnight on the 13th. When he took Alice into his arms, she barely recognized him. At 3 a.m. on St. Valentine's Day, Mittie died. Eleven hours later, Alice died. In his diary for Feb. 14, 1884, Roosevelt wrote only this: "The light has gone out of my life." "With the exception of two brief, written valedictories to Alice - one private, one for limited circulation among family and friends - there is no record of Roosevelt ever mentioning her name again," Roosevelt biographer Edmund Morris wrote in "The Rise of Theodore Roosevelt. ". . . Ironically, the name of another Alice Lee - his daughter - was sometimes forced through his lips, but even this was quickly euphemized to Baby Lee.' Although the girl grew to womanhood, and remained close to him always, he never once spoke to her of her mother. When, as ex-president, he came to write his autobiography, he wrote movingly of the joys of family life, the ardor of youth, and the love of men and women; but he would not acknowledge that the first Alice ever existed." Curiously - since he had no immediate plans to live there - two weeks after the funeral, Roosevelt signed a contract with John A. Wood and Son, carpenters of Lawrence, for the construction of the 22-room house on the hill in Oyster Bay for a total cost of $16,975 - the spacious, museum-like North Room was added 20 year later. He put Alice in the care of his unmarried sister Anna, known as Bamie, and when the house was completed, in 1885, she would take care of it for him. Roosevelt immersed himself in work. He finished his term in the State Legislature, and then headed to Dakota Territory, where he had earlier purchased two ranches. He raised cattle and he hunted and killed enormous numbers of wild animals, some of whose stuffed heads today hang from the walls of Sagamore Hill. But he kept returning East to keep his hand in, for politics drew him like a magnet. And when he wasn't doing politics, he was writing books, something he did for the rest of his life: biographies of Gouverneur Morris and Thomas Hart Benton, a history of the War of 1812, a multivolume history of the winning of the West, narratives of his hunting exploits in the West and in Africa, and many more. The resume is awesome. Roosevelt was a state assemblyman, 1882-1884. He was defeated for mayor of New York City in 1886. A member of the U.S. Civil Service Commission, 1889-1895. President of the New York City Board of Police Commissioners, 1895-1897. Assistant secretary of the Navy, 1897-1898. Commander of the First U.S. Volunteer Cavalry Regiment, known as the Rough Riders, summer, 1898. Governor of New York, 1898-1900. Vice president, March-September, 1901. President of the United States, September, 1901-1909. The big house in Oyster Bay would not remain empty for long. Despite his feeling after the death of Alice that he would never marry again, Roosevelt did just that on Dec. 2, 1886. He married Edith Kermit Carow, an old friend from childhood days with whom he had often spent time during those golden Oyster Bay summers of their youth. The following spring, they moved into the house on the hill. The name Leeholm became a memory, just as did the name Alice Lee. Roosevelt called the place Sagamore Hill - named for a Matinecock Indian sagamore, or sub-chief, named Mohenas, whose people once owned the land that made up the original Oyster Bay settlement. Roosevelt was about to get a houseful of children to play with. In the order born, they were: Theodore, known as Ted (1887); Kermit (1889); Ethel (1891); Archibald, known as Archie (1894), and Quentin (1897). "On Sunday, after we came back from church and bathed, I rowed mother out to the end of Lloyd Neck, near your favorite camping ground. There we took lunch and spent a couple of hours with our books, reading a little and looking out over the beautiful Sound and at the headlands and white beaches of the coast. We rowed back through a strange, shimmering sunset." A visitor to Sagamore Hill today might be startled to walk into a house that is so masculine in its decor - with the one possible exception of Edith's drawing room, where softer colors, French tapestries, elegant rugs and Sevres porcelain dominate. Otherwise, there is a profusion of elephant tusks, bearskin rugs - including snarling heads - and uncountable mounted heads of American and African buffalo, white-tailed deer, elk, bison and antelopes. "Theodore took more pride in those game-heads than in any of the books he had written or the political achievements that had already carried his name across the continent," wrote his friend Hermann Hagedorn in "The Roosevelt Family of Sagamore Hill." "They meant manhood to him, manhood won at a price: tokens of triumph of character over physical inadequacy, testimony to daring, strength, endurance, straight aim and steady nerves, none of them innate, all laboriously acquired." With an energy level that never seemed to run down, Roosevelt went at his playing full tilt. Even if it meant an occasional broken bone or bloody wound. One day he was out riding when his horse tumbled at a fence, and he returned home dripping with blood. Young Alice fled screaming, but Edith took it in stride. The story is told of the day the windmill that pumped their water jammed, and Roosevelt climbed up to see what was wrong. Unexpectedly, the wheel started, hitting Roosevelt in the head. The wound to his scalp bled profusely, so much that he could barely see when he entered the entrance hall, where he met Edith. "Theodore," Edith said evenly, "I wish you would do your bleeding in the bathroom. You'll ruin every rug in the house." Although there were Secret Service agents guarding him when the Summer White House was at Oyster Bay, they didn't follow him everywhere. He once took Ted and two cousins on an overnight horseback ride to visit relatives in Sayville, a good 30 miles away. A heavy rain was falling, and no one recognized the president until they neared Sayville late the next morning. After an overnight stay, they reached home by lunchtime the following day. They were greeted by Edith. "I am glad to see you safely home, Mr. President," she said. The New York World was delighted. 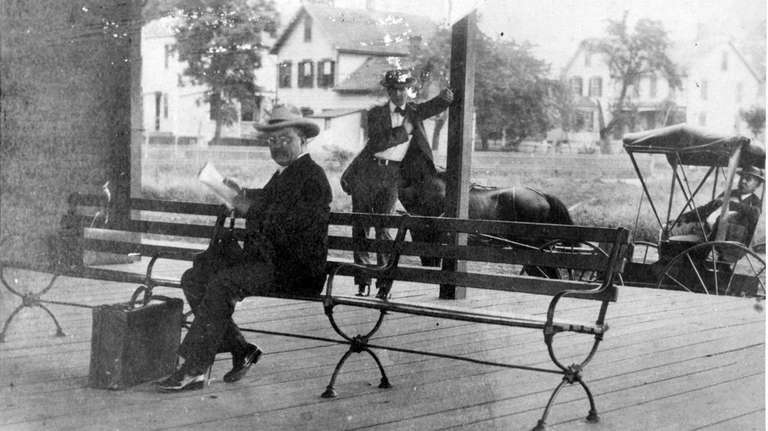 "Now that the President has proved by actual experience that the trip from Oyster Bay to Sayville and back can be made on horseback," the newspaper editorialized, "with what new discovery will he next thrill a waiting nation?" Until he became president, there were no telephones at Sagamore Hill. If anyone wanted to contact them, a phone call was made to a drugstore in Oyster Bay. A boy on a bicycle would then take the message up the hill. The press of presidential business, however, ended the telephone holdout. After Roosevelt succeeded to the presidency upon the assassination of President William McKinley in September, 1901, a brand new telephone was installed at Sagamore Hill; to reach the president you called Oyster Bay 67. No single international crisis focused as much attention on the summer White House as did the Russo-Japanese War. Since 1904, Japan and Russia had been vying for supremacy in northeast Asia, and attacks back and forth had worn down both sides in lives and in finances. By late spring of 1905, the Japanese appeared to have the upper hand. But the western powers, including Roosevelt, were determined to see the affair end with power balanced between the two, rather than one nation overwhelming the other. Ignoring Congress and bypassing his secretary of state, who was sick, Roosevelt became the mediator. By subtle and persistent jawboning, he got the two nations to agree to a peace conference in Portsmouth, N.H. Before that, negotiators from both countries met separately with Roosevelt at Sagamore Hill. Then, on Aug. 5, Roosevelt had the presidential yacht Mayflower anchored in Oyster Bay, and there, before heading for Portsmouth, the envoys met each other for the first time, at lunch. In his biography, "Theodore Roosevelt: A Life," Nathan Miller describes the tricky protocol arrangements that Roosevelt had to deal with. "Protocol and precedence threatened to end the conference before it got under way," wrote Miller. "Which delegate would sit on the presidential right? Which ruler would be toasted first? Who would enter the dining saloon first?" Roosevelt solved all these problems, Miller says, by taking both representatives by the arm on either side of him and steering them into the room together. From a round table, he served them a cold buffet luncheon that was eaten standing up. And then, champagne glass in hand, he proposed a toast to which he would allow no reply: "To the welfare and prosperity of the sovereign and people of the two great nations, whose representatives have met one another on this ship." While the negotiations went on in New Hampshire, Roosevelt monitored the proceedings from Oyster Bay. But he took an afternoon off to try something new. Without the knowledge of reporters, he had himself taken out into Oyster Bay to a rounded steel shell called the Plunger, one of six submarines owned by the Navy. Squeezing in through the hatch, he spent the next three hours on the sub, about an hour of it submerged. He even took the controls himself for a while. He was thus the first American president to ride in a submarine. Just after he left office, he became the first president to fly in an airplane, taking a 3-minute, 20-second flight at about 50 feet at a St. Louis air show in 1910. The Portsmouth negotiations were difficult, but on Aug. 29 the telephone rang at Sagamore Hill. An agreement had been reached. "This is splendid!" Roosevelt declared. "This is magnificent." In a 1904 election-night statement that he later came to regret, Roosevelt said he considered his 3 1/2 years in office as a full term, and would not run again for president, thus honoring the two-term precedent set by George Washington. When he left the presidency in 1909, Roosevelt went home to Sagamore Hill. But now it was a full-time residence. Or, as full-time as any place could be for someone as active as Roosevelt. He soon left with his son Kermit on a year-long safari to Kenya, where they killed, by Roosevelt's count, 512 animals, large and small. Many critics objected to what they saw as game butchery. He responded by saying that every animal killed was either used as food for his large retinue or for scientific purposes, that is, for museums, except for "about a dozen" returned to Sagamore Hill as trophies. On his return, unhappy with the conservative direction of the administration of President William Howard Taft, Roosevelt bolted the Republicans to form the Progressive Party, the so-called Bull Moose Party, to run again for president in 1912. With Taft and Roosevelt splitting the Republican vote, the election was won by the Democrat Woodrow Wilson. Back at Sagamore Hill, Roosevelt continued to write magazine articles and books, especially his autobiography. By July, 1913, he had spent more time living continuously at Sagamore Hill than he had spent living in any one house since he was a child. He had time to think back on the richness of his life. "There are many kinds of success in life worth having," Roosevelt wrote in his autobiography. "It is exceedingly interesting and attractive to be a successful business man, or railroad man, or farmer, or a successful lawyer or doctor; or a writer, or a President, or a ranchman, or the colonel of a fighting regiment, or to kill grizzly bears and lions. But for unflagging interest and enjoyment, a household of children, if things go reasonably well, certainly makes all other forms of success and achievement lose their importance by comparison." But he was getting restless. So he proposed a seven-month, 1,500-mile expedition, again with Kermit, through Brazil, to explore an Amazon River tributary called Rio Duvida, River of Doubt. To those who said it was too dangerous for a 55-year-old, he replied, "I have to go. It's my last chance to be a boy." It was dangerous, more so than Roosevelt imagined. Boats overturned, food supplies ran low, a man drowned, another was murdered and Roosevelt badly injured a leg, which became infected and led to a high fever. He also contracted dysentery and malaria, at one point having to be carried in a litter. Once more, he survived, though he was 57 pounds lighter and his health was permanently damaged. The Brazilian government, in his honor, renamed the river Rio Roosevelt. With Wilson in the White House trying to keep the United States out of the war that had begun in 1914 in Europe, Roosevelt the interventionist found a prime target. He pushed hard for American entry into the war - once referring to Wilson as a "lily-livered skunk" - and when the United States entered the war in 1917, he went personally to see Wilson with an offer to recruit and lead a volunteer force into battle, just as he had done in the Spanish-American War. Biographer Brands thinks that Roosevelt was looking for one last chance at heroism. "The romantic notion of death in battle held an irresistible appeal for him," he writes, "the more so as he felt old age coming on and the prospect of increasing enfeeblement." Wilson turned Roosevelt down, saying that volunteers would seriously interfere with the creation and deployment of an effective regular army. So Roosevelt turned to his four sons as surrogates, and, as the former president, he had some pull as to their assignments. "With their enthusiastic assent," Brands writes, ". . . he eschewed safe staff positions, aiming instead to place his boys precisely where he wanted to be: amid the fiercest fighting." So Roosevelt stayed at Sagamore Hill, and he and Edith hung in the entrance hall the small flag, blue stars on a white background, that showed he had sons in the service. Theirs had five stars: one for each of his four sons, plus one for Ethel's husband, Richard Derby, a medical doctor. "We boys thought it was up to us to practice what Father preached," Quentin told a friend. Unable to go to the front himself, Roosevelt spent much of his time writing his opinions about the war, and how it was being handled by Wilson and the Democrats - badly, he felt - for monthly magazines as well as the daily Kansas City Star. Wilson felt the lash of Roosevelt's tongue, but he generally kept quiet. "I really think the best way to treat Mr. Roosevelt is to take no notice of him," he wrote to a friend. "That breaks his heart and is the best punishment that can be administered." Roosevelt was about to get his heart broken in a way that no words could accomplish. Ted and Archie, then 30 and 23, were commissioned as Army officers and sent to France. Kermit, who was 28, took a commission in the British Army and was sent to Mesopotamia (now Iraq) with a motorized machine-gun unit. Derby, Ethel's husband, was assigned to an Army hospital in France, and Ethel went along as a nurse. Even Ted's wife, Eleanor, went to France, the first woman to be sent overseas by the YMCA, to organize canteens for men on leave. And the youngest, Quentin, 19, fascinated by the new airplanes, enlisted in the Army's air squadron, and, after earning his wings, was shipped off to duel with German airmen. In addition to worrying about his sons, Roosevelt had recurring health problems. Although he had kept it a secret for most of his life, a doctor at Harvard had told him he had a weak heart, and to avoid too much exertion - advice he seems to have immediately and permanently ignored. He had occasional stomach trouble, insomnia, chest colds and asthma. He was hospitalized for a recurrence of the problems with the leg that had been injured in Brazil, and an inflammation in his left ear eventually led to deafness on that side. He was already blind in his left eye, due to an injury received in 1904 while boxing at the White House. Sagamore Hill was almost empty. "They have all gone away from the house on the hill," Edith wrote to her sister, Emily. The boys were in harm's way. Quentin got pneumonia, but recovered. Archie was wounded in the left leg and arm by shrapnel and given the Croix de Guerre by the French. Ted, promoted to lieutenant colonel, was decorated for "conspicuous gallantry" after being gassed, and was later wounded in the leg. Kermit, who had received the British Military Cross for gallantry in action, got a discharge so he could join the American forces, where he was made a captain in an artillery regiment. It was Quentin who Roosevelt worried about the most. In early July of 1918, Quentin wrote that he had downed his first German plane, and there was celebration on the hill. But on July 17 an Associated Press reporter drove up to the house from Oyster Bay and told Roosevelt that Quentin's plane had been shot down behind enemy lines. He would soon find out that Quentin was dead. It is Quentin for whom Hazelhurst Field in Garden City was renamed Roosevelt Field in 1919. "Roosevelt never got over Quentin's death," writes Brands. Or, as Roosevelt's close friend, Hermann Hagedorn, wrote at the time, "The boy in him had died." Occasionally, when Roosevelt thought no one else was around, he could be heard to say, softly, "Poor Quinikins!" The father wrote his own tribute to the son: "Only those are fit to live who do not fear to die; and none are fit to die who have shrunk from the joy of life. Life and death are parts of the same Great Adventure." But he wrote little else about him. "There is no use in my writing about Quentin; for I should break down if I tried," he said in a letter to Kermit on Aug. 14. "His death is heartbreaking." On Oct. 27, 1918, when the end of the war was only three weeks away, Roosevelt turned 60. Persistent infections had bothered him since the Brazil episode, and he had been diagnosed with inflammatory rheumatism. On Nov. 11, the day the armistice was signed ending the war, he was admitted to Roosevelt Hospital in New York with pain wracking his body. He remained until Christmas Eve. "Well, anyway, no matter what comes, I have kept the promise that I made to myself when I was twenty-one," he said to his sister Corinne from his hospital bed. "I promised to myself that I would work up to the hilt until I was sixty, and I have done it. I have kept my promise, and now, even if I should be an invalid - I should not like to be an invalid - but even if I should be an invalid, or if I should die, what difference would it make?" At 4:15 the next morning, Theodore Roosevelt died in his sleep of a coronary embolism.